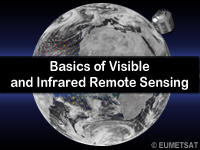 This lesson presents the scientific and technical basis for using visible and infrared satellite imagery so forecasters can make optimal use of it for observing and forecasting the behaviour of the atmosphere. The concepts and capabilities presented are common to most international geostationary (GEO) and low-Earth orbiting (LEO) meteorological satellites since their inception, and continue to apply to both current and newer satellite constellations. The lesson reviews remote sensing and radiative transfer theory through a series of conceptual models. Discussions contain explanations of the different Meteosat First Generation imager channels and the phenomena that they can monitor individually and in combination. This lesson is an online version of the first ASMET (African Satellite Meteorology Education and Training) lesson published on CD-ROM in 1997. Conversion to HTML is courtesy of EUMETSAT. While the images have not been updated, the concepts are fundamental and remain relevant today. Most of the images are from Meteosat and depict weather conditions over Africa, although some GOES imagery is included as well. THE LESSON IS MUCH HELPFUL. Remote sensing is not my strongest topic, so this lesson was very helpful!! Some of the graphs have lines with values that aren't clearly visible. I love this unit, however, i read a wrong document before answering this quiz. I agree on the this Units of study,.. It is very useful, particularly the practical examples. This is an excellent lesson and review for both new and seasoned (pun partially intended) meteorologists and others who use and interpret satellite imagery for their work or field of study. Basic overview of Satellites and how they work. Useful course. More detailed notes to explain and make simple especially to a new comer. Not a fan of paying my university to make me sit in front of a computer and perform modules created by another institution. I find these to not be a very good training tool and a robbery of my educational experience. It is not set up in a way to help me learn...all I am doing is wasting time going through all the units to find one answer. When I tried looking for key words in the outline that did not even cover the answer to the question for the keyword I used. Very time consuming without great score... I spent hours trying to do quiz 1. I would strongly recommend this lesson to others who are interested in the weather. I thought this subject was very relevant to my area of study. they use the same images for each section and put the information for the entire course on each image. but it is very helpful and informative. The lesson is very solid in the theory of satellites and how they work. A great module. The material is all relevant, the only thing that could be improved is using examples with the new GOES 16. It's good to have challenge with your knowledge, but better to improve it. Informative and educative lesson.Has been simplified for easy understanding the topic.Well done. A straightforward module. good content, easy to absorb. 09 May 2016: HTML and media assets in this lesson have been updated for current browsers and mobile devices.